I recently acquired two large computer screens, which was great for viewing multiple documents at the same time but was causing stiffness in my muscles from having to awkwardly rotate to view each of the screens. The lateral slide helped because it now allows me to slide over in front of each screen, so I no longer have to contort my spine. 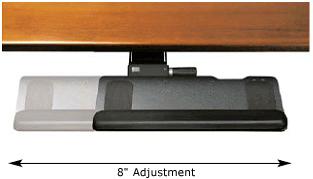 Additionally, the slider was easy to install on my humanscale keyboard tray. Ergodirect was a great company to work with; I have no complaints and would order from them again.